On Saturday, June 3 at 8:30am Tom Reed will hold a town hall meeting at the Trumansburg Fire Station. Sharon Murphy, a member of Tom Reed’s staff reserved the space with the Trumansburg Village Clerk. When the Fire Chief and a Village Trustee questioned the choice of venue, the Village Clerk said that she had been told the school spaces were all booked for end of year activities. For the Fire Chief, the concern was parking and building occupancy. Should an emergency occur, he needs parking for his volunteers and the EMS staff so they can access equipment and vehicles quickly. He knows the potential for a crowd at these meetings, and takes the need to run his department safely and efficiently quite seriously. Trumansburg fire hall has a woefully inadequate parking area due to site limitations, and though a good size meeting room, still inadequate for a crowd such as the Ovid fire hall saw this winter. 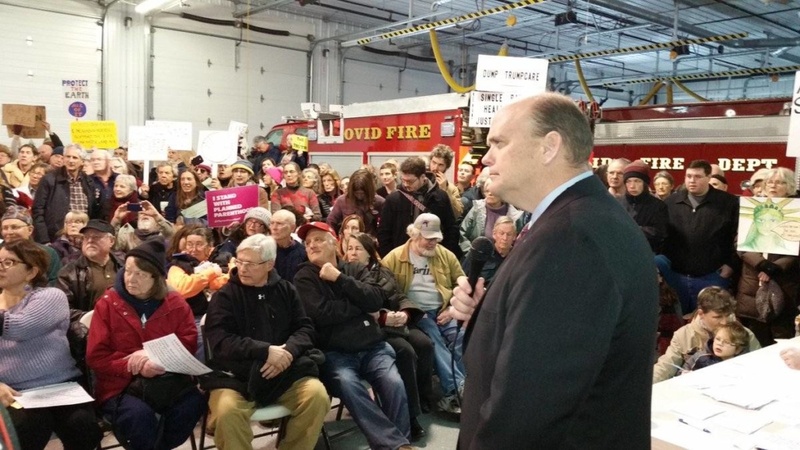 Fire halls filled with angry constituents play to Tom Reed’s man-of-the-people image. It just made sense to find a room that could comfortably accommodate more people and cars. The Village Trustee called the Trumansburg School District Office–on the off chance communication had failed somewhere along the line. And lo, the high school auditorium was available, so she booked it. There was no indication that Reed’s office had contacted the school. The Trustee then called Ms. Murphy to inform her of the opportunity, but she declined, stating that the Congressman preferred the fire station, as it suited his vision for a town hall style meeting. The Trustee attempted to communicate how awkward and potentially chaotic the fire hall would be, in comparison to the comfortable auditorium with a good sound system and ample parking, but really all she could gather was that they were committed to the “down-home” image. As of this writing, village officials are still evaluating the location. You may remember that in March, a similar story played out in Ithaca. According to local leaders, Congressman Reed’s staff did try to book the auditorium at Ithaca High School, which was, in fact unavailable. The town hall was held at Southside Community Center. It’s possible that the Village Clerk misunderstood or invented the assertion that the auditorium was already booked. But when pressed by the Village Trustee to hold the meeting in a safer, more comfortable, and more logistically better location, Reed’s staffer held firm to his aesthetic. This begs the question: Does the cramped space full of shouting constituents play to Mr. Reed’s man-of-the-people image? It is irrational and troubling that Tom Reed and his staff would rather risk public health and safety in favor of managing his public persona. I believe Tom Reed’s preference of the Fire Station over the school auditorium is an attempt to control crowd size. He prefers the smaller venue, for obvious reasons. I called reeds office before the ithaca town hall to complain about the venue and was told by a staffer “tom doesnt like to be on a stage in front of his constituents” doesnt make for a good photo op i guess! Is there any way to get the transcript of the town hall meeting in Trumansburg on June 3rd. Hi Richard! I’ll ask around if anyone has one. Our county guest bloggers will be posting about the town halls soon, please keep an eye out! Yes, I will keep an eye out.